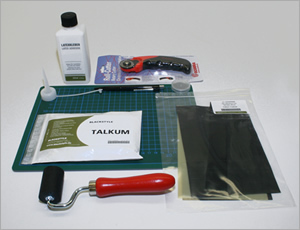 Our latex designer set contains all the tools and ingredients needed to work with latex. So everything from repairs to elaborate designs can be made. There are no limits to your own creativity. Everything is included for cutting and gluing. To mark a special ballpoint pen with silver ink. In addition, we have included the most important materials for minor repairs. Delivery costs: Germany: 6,90 Euro, COD: 12,50 Euro. Outside of Germany: see "shopping" in service category. The exact shipping costs will be shown in the ordering process.